Sam Billings also praised chinaman bowler Kuldeep Yadav who bowled superbly against his side and kept India A in the hunt for a win with a five-wicket haul. 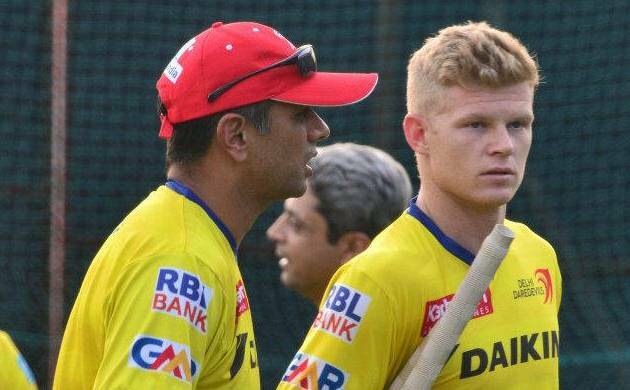 England batsman Sam Billings says working with Rahul Dravid during his six-week IPL stint for Delhi Daredevils last year helped him improve his footwork against spin bowling. Billings smashed a match-winning 93 to guide England to a three-wicket victory in a warm-up match against India A ahead of the limited overs series against the hosts. The match also saw Mahendra Singh Dhoni leading an India side for one last time. “It’s (IPL stint) definitely going to help (in the upcoming series). My footwork against spin improved just in the six weeks here working with Rahul Dravid, one of the best players ever to play the game. It’s an amazing experience and one I would like to have again,” Billings said. Billings described Dhoni as a hero not only in India but across the world. “He’s a hero around India and around the world. What a great career he has had just as a captain! Showed today that plenty of cricket is left in him, didn’t he,” said Billings who made 93 and also stitched two important partnerships to help England get past India A’s stiff total of 304 for five in the tourists’ first of two warm-up games at the Brabourne Stadium last night. Dhoni had announced that he was stepping down as captain from the limited over scene to pave the way for Test skipper Virat Kohli to take over in all three formats. A big crowed turned up to watch Dhoni lead a team for the last time and Billings, who played some audacious reverse sweeps during his knock, was appreciative of it as he said it mirrored the type of situation his team will encounter during the six-match limited over series featuring three ODIs and as many T20Is, commencing at Pune on Sunday. “What a great crowd here for a warm-up game and so realistic to the first game of the series in a couple of days! It’s great. All the best to him (Dhoni). “It was great to have such a great crowd for a warm up game. It makes it far more realistic and competitive. If it was a completely empty stadium, playing against Mahendra Singh Dhoni, we should have been playing on a Maidan! At the end of the day you would have a crowd whether it’s IPL or Big Bash (in Australia),” said Billlings. Billings also praised chinaman bowler Kuldeep Yadav who bowled superbly against his side and kept India A in the hunt for a win with a five-wicket haul. “He’s a good bowler, isn’t he? He’s there for a reason playing in a very good side. He howled brilliantly. The other (Yuzvendra Chahal who took one wicket with orthodox leg spin) played in IPL, didn’t he?